What makes Crans-Montana so unique is not only its panorama, its year-round sunshine, the fantastic run from the glacier on Plaine Morte all the way down a 6,000 foot vertical drop to the village, but its spectacularly scenic golf courses where the ball travels much further because of the high altitude. But insiders know there is more to Crans-Montana than just the high plateau. It comprises medieval villages and families like the Barras and Bonvin that go back to the 13th and 14th century respectively. There is also the tradition of vertical living through seasonal migration, from the vineyards near the Rhone to the Alpine meadows and in-between. Above all, it is about the people. 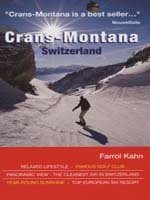 This new book from Farrol Kahn gives you an insight to the people and places of Crans-Montana, known for its openness to accept all-comers. In a research programme on air pollution, the Swiss Federal government found that the cleanest air in the country was in Crans-Montana.